Kate Middleton is disgusted with Prince William for participating in the annual Christmas Boxing Day pheasant hunt. You’d think that after the controversy surrounding Prince Charles’ gun photo, Prince William would know better than to agree to a Boxing Day pheasant hunt. Unfortunately, that’s exactly what we’re hearing, courtesy of the Daily Beast’s minute by minute breakdown of the royals’ Christmas and Boxing Day plans. 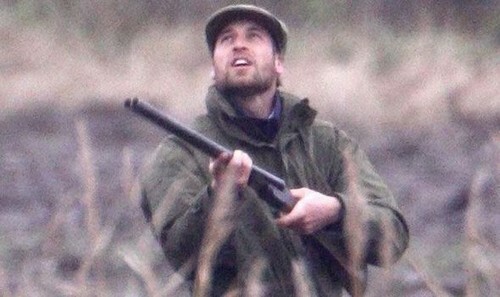 According to the report, Prince William was planning to participate in the Boxing Day pheasant hunt along with Pippa Middleton and James Middleton. That means that they’ll be toting guns, strutting around the Sandringham estates, and shooting pheasants. Granted, it’s an annual tradition and it’s unlikely that the press will get pictures of the royals or the Middletons holding guns or actually shooting any pheasants, but the mere fact that they would continue such an outdated tradition is means for pause. I mean, Kate Middleton is changing royal protocol as we speak, and in fact, was the entire reason that Prince William and Prince George didn’t spend Christmas evening with Queen Elizabeth in a stuffy castle. The timing is also quite disrespectful, isn’t it? Prince William is an advocate for all these animal rights groups, and yet continues to be a hypocrite by joining all these hunts. The royals will claim it’s tradition, but all it does is support the image of the royals as a bunch of pansy hypocrites who can’t stick up for what they believe in. Of course, this is just the tip of the iceberg for Pippa Middleton, who is no stranger to bad publicity. At this point, one has to wonder if she’s actively trying to generate hate among the general public, since everything she does is in such bad taste. Selling royal secrets to the Today Show? Why not. Writing irritating public opinion pieces in magazines? Why not. Shooting pheasants with guns? Why not. It’s not even surprising anymore, although it does speak to the family values and morals. Kate Middleton Birth Induced Like Princess Diana’s With Prince William?